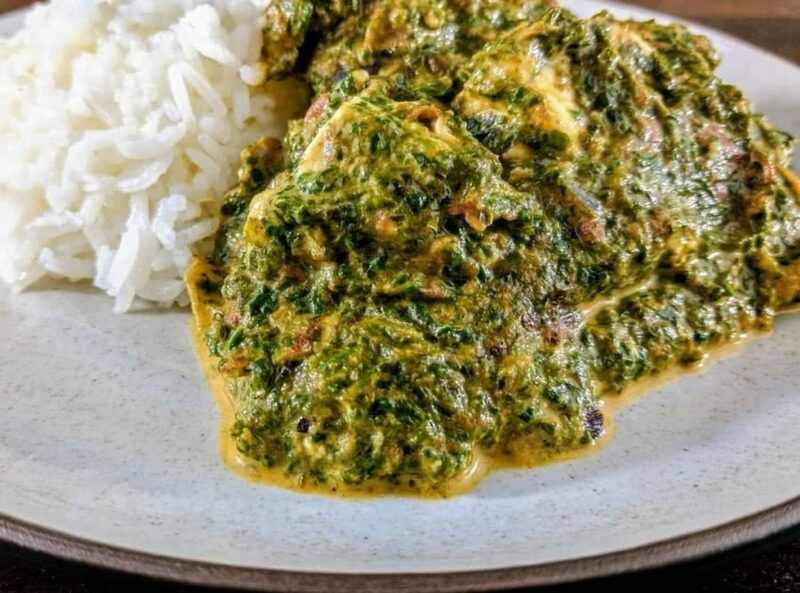 Saag Paneer is a very popular and delicious Indian recipe that is found in nearly every Indian restaurant that I have dined at over the years. I wanted to re-create this recipe at home from scratch, starting with the cheese. The paneer was remarkably easy to make, but it does call for a fair amount of inactive time which requires a bit of planning ahead. The flavors of the dish hit the spot for an Indian craving, and the freshly made paneer does not disappoint. The recipe calls for 1/2 inch pieces, but 1/4 inch would be a better size. Any combination of spinach and mizuna that adds up to 8 ounces. When making the paneer, make sure to stir the pot of milk occasionally while bringing it to a boil. The milk particles can stick to the bottom of the pan, which is a pain to clean later. Allow the milk mixture to drain for 30 minutes instead of 15 minutes. Even after 15 minutes it is still very hot to handle and there is a lot of liquid that needs to continue to drain. When making the spinach sauce, cook over a smaller burner to ensure that the garlic/ginger mixture does not burn. I used a cast iron pan and it was too hot while cooking on medium heat over the largest burner. While cooking the sauce, I panfried the paneer I used 1 TBSP of grapeseed oil for about a minute on each side in a small cast iron pan over medium heat. After it has cooled, dice into 1 inch chunks to place into the sauce later on. For the optional step of milk or cream at the end, I stirred in 1/4 cup of heavy whipping cream to make it all the richer.